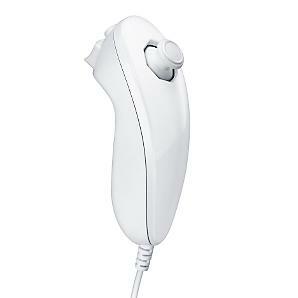 The Nunchuk is a controller for the Wii, which is also compatible with the Wii U. It can be plugged into a Wii Remote or a Wii MotionPlus accessory, and is used primarily for precision controlling in Wii games, due to the Nunchuk possessing a control stick that the Wii Remote alone does not. Official Nunchuks are always wired, though unofficial wireless Nunchucs exist. This page was last edited on 24 September 2017, at 16:45.